Reportedly, there once was a hillside in southern California, near Pasadena, that was so massively blanketed with California poppies that it was visible from ships more than twenty-five miles out to sea. The display of poppies at the Granada Native Garden isn’t nearly that dramatic, but Spring is the time of the year when the Granada Native Garden attracts the most attention from passersby. The annual display of golden California poppies across the state’s vast hillsides makes the flower a fitting symbol for the Golden State. 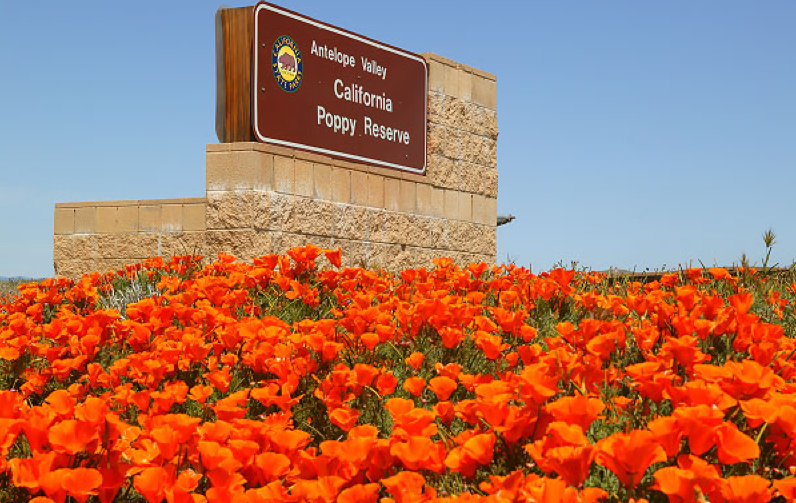 The 1,745-acre Antelope Valley California Poppy Reserve, in the high desert area near Los Angeles, is devoted almost entirely to the poppy. It was proclaimed the state flower, unofficially by the California Floral Society in 1890 and officially by the state legislature in 1903. 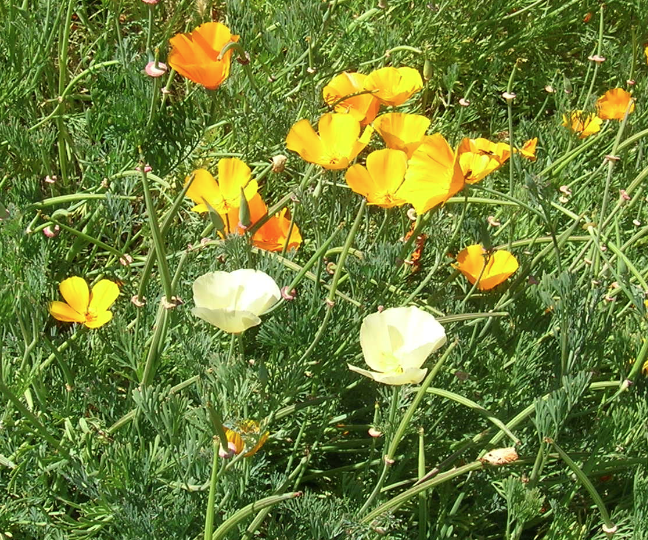 April 6 is celebrated as California Poppy Day; one week in May is even designated as California Poppy Week. Furthermore, this poppy is particularly adapted to the California climate. It is drought-resistant and freely reseeds itself, to appear in the spring year after year, especially in soil disturbed by anything from footprints to farming activity. Its flowers can be seen as early as February and may linger until the beginning of fall. During this time it attracts pollinators such as bees and hummingbirds; it‘s comical to watch a bumblebee alight on a blossom and bend it over with its weight! The seeds are especially favored by mourning doves and quail. The poppy was an important source of food and oil for the indigenous people of California, who also used the pollen as a colorful cosmetic; after walking thru a field of poppies, you will probably find bright smudges of golden pollen on your clothing. Different tribes used parts of the plant for different purposes: to alleviate toothaches, as food, to heal babies’ navels, and to induce sleep. The blossoms may become smaller and paler in color as the summer wanes. If you are ambitious enough to cut them back to the first set of leaves after the first blossom dies, they may produce a second bloom. Each plant has a carrot-like taproot (it’s even bright orange!) which may persist and leaf out again from year to year. Occasionally, a white genetic variation will appear in a field of golden poppies (see below ↓ ). 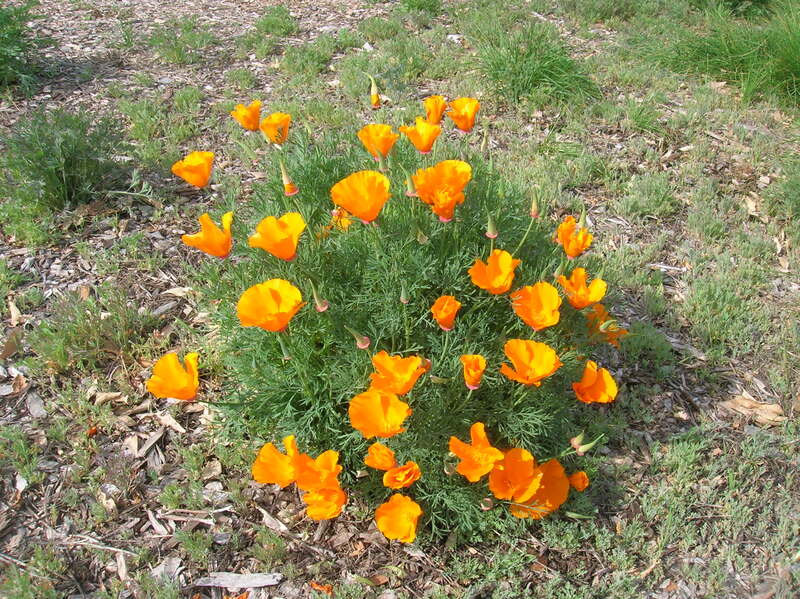 While oriental poppies share a dubious reputation as the source of opium, containing alkaloids such as morphine and codeine, the California poppy does not share this characteristic and is not addictive. However, it does possess certain chemical compounds that have a sedative effect. 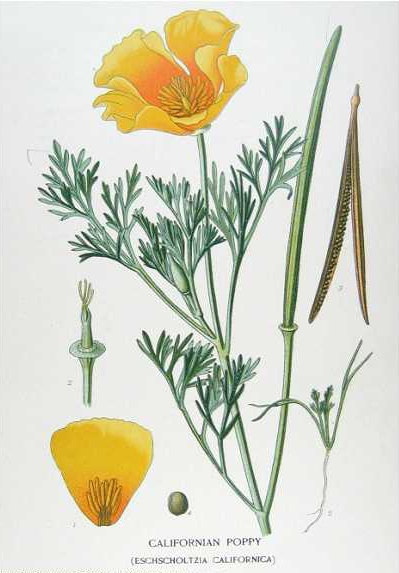 The flower was named in 1816 as the first member of the genus Eschscholzia by the German botanist Adelbert von Chamisso, after his fellow botanist Johann Friedrich von Eschscholtz. 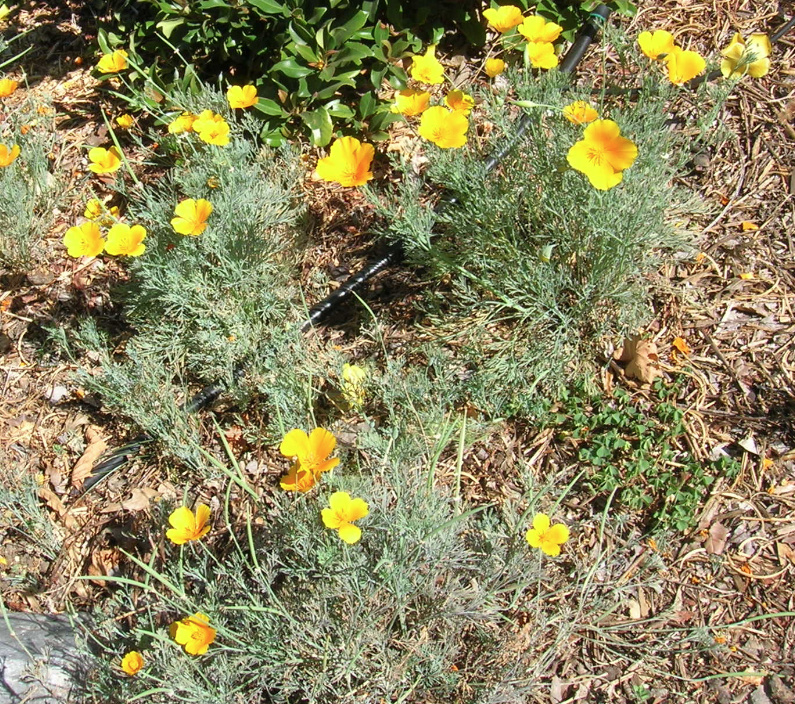 Fittingly, among other names that have been given to the California poppy are copa de oro (cup of gold) and dormidera (the sleepy one); in the latter case, this name does not derive from its sedative properties, but from its tendency to open its petals late in the morning and to close them again in the evening. This strategy probably serves to conserve water during the heat of the day, along with its finely divided, fern-like leaves. Spanish explorers named the coast “Land of Fire”, not only because of the bright color display, but also because of the hot, dry climate and frequent fires caused by lightning strikes. 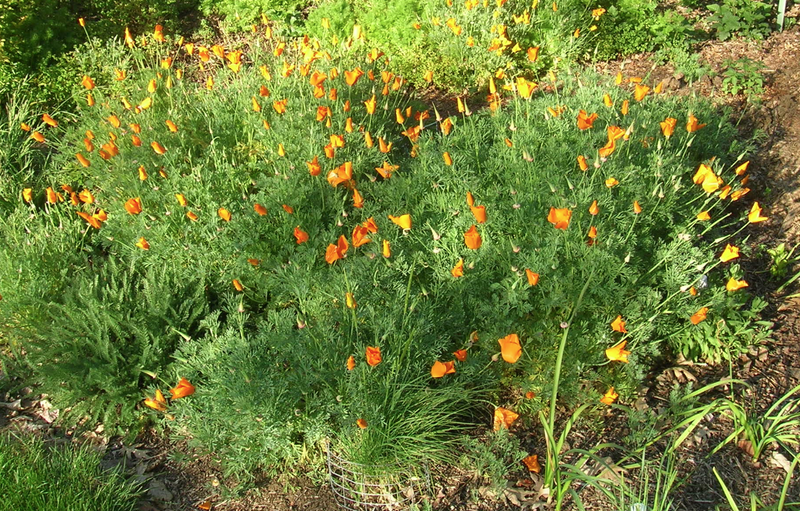 It is commonly believed that it is against the law to cut or damage the California poppy. However, this law only applies to damaging any plant growing on state or county property, except by authorized government personnel or contractors, or on private property without permission of the owner.